This Hi-Visibility Long sleeve T-shirt with reflective striping features 3.67 oz 100% micro-mesh w/wicking treatment. Excellent breathability and comfort. Reflective armbands for nighttime, 3M Scotchlite reflective material w/ 4" contrast backing. CSA-Z96-09 Compliant-Class 2, level 2. BC-MoT T-09/05-Class 2,Type 1. ANSI107-2010 Compliant-Class2,Level 2. Avail in Fluorescent Orange or Flor Yellow/Green. 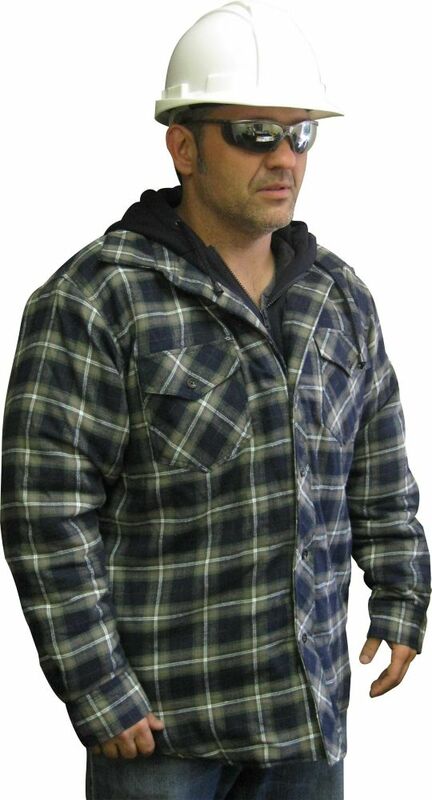 Hooded Quilted Plaid Shirt Medium The Storm Fighter hooded quilted flannel shirt is a great layering piece during brisk spring or fall days. This quilted flannel shirt will keep you warm during your project on it's own or as a layering piece. Includes a snap front closure, two chest pockets, and snap closure sleeve cuffs.